In a very scientific poll I recently conducted, I was quite surprised by the landslide majority of people who prefer the Dirty Martini over all others. While I am also a fan, I didn’t realize so many others were too, but who wouldn’t like a little salty brine in their cocktail? If you thought the history of the Martini was light, the facts of this one will prove to be nothing more than a speed bump on the path to your next drink. The best I could come up with, after months of research was a vague reference to Russians adding pickle brine to their vodka as a hangover cure. Another reference simply stated that it can be traced back to the time of Franklin Delano Roosevelt, like that has any relevance. So I am going to take this opportunity to write my own history for the drink. 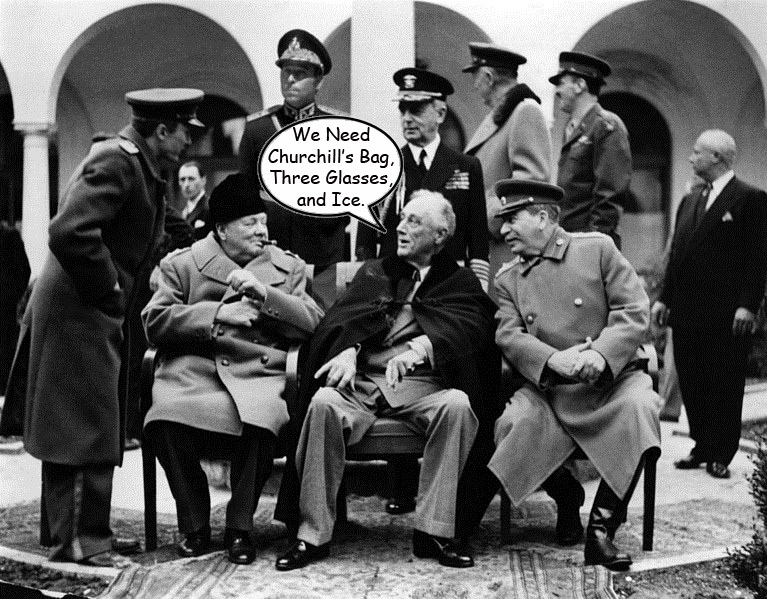 A product of the Yalta conference, the Dirty Martini was slightly overshadowed by other world changing moments. The drink came about one morning when FDR commented to Stalin that he was feeling a little hung-over. Joseph, being the caring and compassionate man he was, suggested his favorite morning cure-all of vodka and pickle juice. Regrettably, neither pickles nor vodka had been served with breakfast that morning. Fortunately, Churchill, being a man of the sauce, reached into his valise and produced a bottle of gin and a jar of olives.Dumping the coffee out the window and using the silver coffee pot as a makeshift shaker he quickly fashioned a batch of cocktails, tinted slightly dark (or dirty) by the remaining coffee. The three of them unanimously proclaimed the recipe a victory and the rest is history. Enough poetic license, on to the important part. Like the Martini, the proper ratio depends on the palate of the imbiber. I prefer two and one half ounces of Plymouth gin mixed with one-fourth ounce of dry vermouth and one-half ounce of olive brine. This drink falls into a grey area for my translucence test since the brine does make the drink slightly cloudy. I typically shake this one because of its ease and I like the tiny slivers of ice that come through the strainer. I also prefer bleu cheese stuffed olives in this drink. With your first sip, just imagine what the fate of post-war Germany could have been had FDR been hung-over. Add all three ingredients to an ice filled shaker. Mix vigorously and strain into a chilled cocktail glass. Garnish with three olives.